Today I am calling on the Department of Veterans Affairs to publicly reveal the VA’s plan to ensure all veterans receive the GI Bill benefits they have earned, summarize how the VA will properly implement the Forever GI Bill, and respond to concerns about leadership of the VA’s IT transition. Veterans have not been receiving the proper benefits and this situation is completely unacceptable. The VA must take immediate action to ensure that veterans receive the benefits promised to them through the Forever GI Bill. The failure to properly administer these benefits will cause undue financial hardship for the men and women who have bravely served our nation in uniform. These veterans must be made whole, and steps must be taken to ensure no veteran loses their educational opportunity or housing because of the VA’s incompetence. I will work with my colleagues to continue pressuring the VA to undertake the work necessary to ensure all veterans receive the GI Bill benefits they have earned. If you are experiencing financial hardship because of GI Bill funds not received, please call 1-888-442-4551 ASAP. I’m excited about the many new voices and perspectives that will be a part of our leadership team. 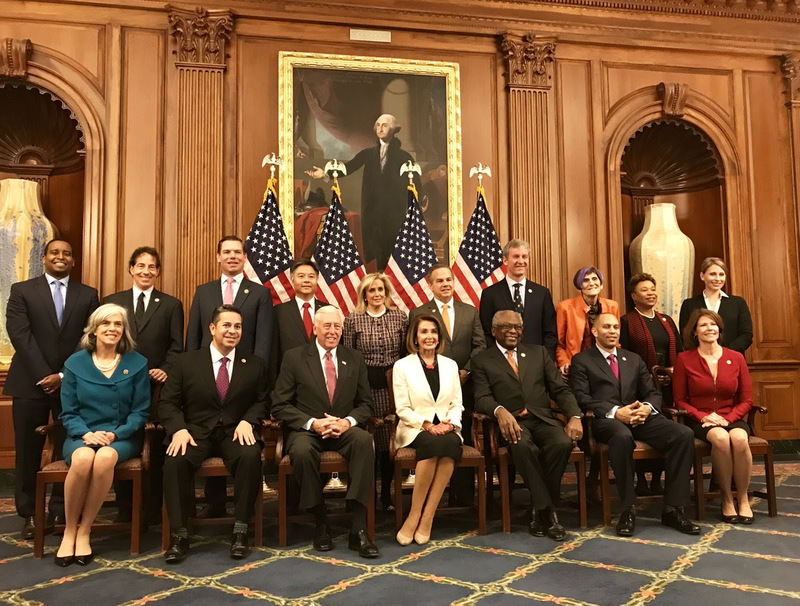 Our caucus has elected my friends Rep. Katherine Clark as Vice Chair of the House Democratic Caucus, Rep. Hakeem Jeffries as Chairman of the House Democratic Caucus, Rep. Ben Ray Luján as Assistant Democratic Leader, Rep. James Clyburn as Majority Whip, and Rep. Steny Hoyer as Majority Leader. We have an array of candidates who will diversify the leadership of the House and help us pursue an agenda that will benefit hardworking families in New Hampshire and across the country. I also voted for Nancy Pelosi for Speaker of the House because of her proven effectiveness as a leader and experience advancing meaningful legislation through the House of Representatives. I look forward to working with our entire caucus to improve access to quality, affordable healthcare, protect our environment, and expand economic opportunity for all Americans. I was honored to be selected by my colleagues as a Vice Chair of the New Democrat Coalition. The New Democrat Coalition represents the type of results driven focus that the American people expect from their elected leaders. We strive to build consensus amongst our colleagues on both sides of the aisle and advance legislation that will bolster economic opportunity for hardworking families and create an environment in which small businesses can grow and thrive. As Democrats assume the majority in Congress, the New Democrats will be a force for action. I look forward to pursuing policies that will protect our environment, improve access to healthcare, and restore accountability in Washington all while growing our economy and creating jobs. The extensive report on climate change released last week by the U.S. Global Change Research Program helps confirm what we already know: climate change poses a serious threat to our environment, public safety and economy. We’re already seeing the impact of climate change in New Hampshire, and we owe it to our children and future generations to act swiftly and boldly to address this growing crisis. You can read the full report here. There’s still time to explore your options for health insurance in 2019 and get the healthcare plan that works best for you and your family. Open Enrollment ends December 15th, so be sure to visit http://healthcare.gov or call 1-800-318-2596 to start shopping and get covered. Last week, I joined Senator Hassan and survivor advocates from the New Hampshire Coalition Against Domestic and Sexual Violence (NHCADSV), the University of New Hampshire Prevention Innovations Research Center, Keene State College, Colby Sawyer College, Plymouth State University, and Rivier University in Concord to highlight the potential negative impacts of the proposed changes to Title IX announced earlier this month by Secretary of Education Betsy DeVos. Title IX mandates equal opportunity to education, and the proposed changes will undermine that goal, as they serve to make schools, campuses and students less safe. Secretary DeVos should reevaluate her proposals and instead focus on improving the safety and well-being of students. I appreciated the opportunity to hear from so many incredible survivor advocates and educators at this discussion, and I will continue to work with them to strengthen safety for all our students. As your Representative, my most important responsibility is supporting Granite Staters when they need help with federal agencies. I was contacted by Shahad Mattloob of Nashua, who had an issue of concern regarding her Employment Authorization Document (EAD) card from the United States Citizenship and Immigration Services (USCIS). My staff worked with USCIS and helped resolve Shahad’s issue. If my office may be of assistance with a problem you are experiencing, please reach out to my staff at 603-226-1002 so we can learn how we may help. As always, thank you for everything you do to make New Hampshire such a wonderful place to live, work, and raise a family. Have a great weekend!